This article is about players of the Super Smash Bros. games. For the playable characters in said series, see List of Super Smash Bros. series characters. A smasher refers to a dedicated player of any of the games in the Super Smash Bros. series, though the term came into regular use in competitive Super Smash Bros. Melee. Although even casual Smash Bros. players can be considered smashers, the term is mostly used in the Smash community when talking about competitive players and professionals, especially those who compete in local or regional tournaments. A crowd of smashers gathered around the TV for the Australian tournament, SEAT. Many smashers have earned recognition by participating in (or hosting) unofficial tournaments, mainly for Melee. These tournaments have allowed smashers around the world to connect with others and make a name for themselves in the smash community, as well as test their skills and possibly earn prizes. The competitive community expanded to gain national recognition over the course of its golden age from 2003 right up to the 2008 release of Super Smash Bros. Brawl. Fuelled by unprecedented enthusiasm from players around the world, the game earned a position in the Major League Gaming roster of events and thousands of dollars were awarded to top players at both MLG-sanctioned tournaments, as well as other tournaments organized by local community figureheads. 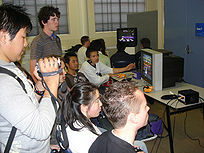 Commentary refers to comments made and discussions held by commentators (often smashers themselves) during a match in any Super Smash Bros. tournaments. Commentators generally have knowledge on the physics of a Super Smash Bros. game on an advanced or professional level with an understanding of the game's mechanics. Prog and D1 are perhaps the most well-known commentating pair for Super Smash Bros. Melee and Project M, with Scar and Toph, and Wife and Husband also being quite popular. HomeMadeWaffles was also very well-known for his ecstatic comments during matches. In fact, his commentary of the match wherein the "Wombo Combo" was executed is the subject of a popular meme within both the Smash Bros. community as well as the competitive gaming community. The term "commentator's curse" is commonly used to describe events taking place in a match that do not favor the player that the commentator was talking about (making it more of a jinx than a curse). The opposite of the commentator's curse is the "commentator's blessing", where the events instead favor the chosen player. This page was last edited on August 13, 2018, at 16:32.